The only privately owned full dome available for charter service. With 85 feet of glass, it is like no other car, seating in the dome for 52 upstairs and 12 downstairs with a full service wet bar, full dining room and gourmet kitchen downstairs. 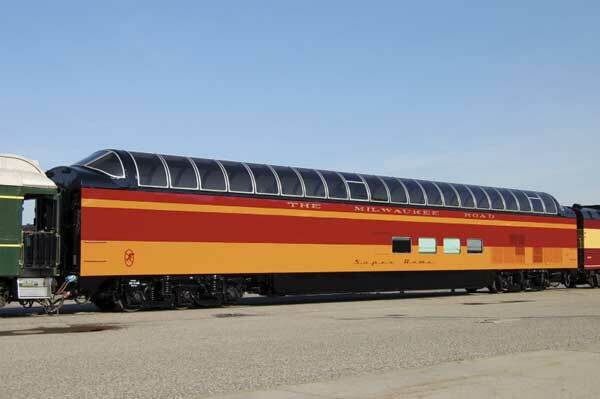 Built for the Milwaukee Road by Pullman Standard in 1952 as dome car 53. Acquired by Canadian National in 1964 and named “Athabaska”. Sold to the Chicago & North Western Railway for business service in 1986 and renamed “Powder River”. Acquired by North Carolina DOT in 1996 and received over $1.8 million for mechanical upgrades including new windows, new restrooms, upgraded kitchen, new electrical system and a new 26 ton air conditioning system.